Who doesn’t love a chilly 3.30am start to their day? Well not us particularly, but the thought that we might make it to the slopes of Champoluc by lunch time spurred us on. After much fast driving to the airport we arrived in good time to sit down to a civilised breakfast at Pret a Manger. I say civilised, it was only 5.30am at this stage, but their coffee and freshly baked pastries are by far the best offerings at Stansted, so an essential stopover on the way to the plane. Sadly, for some of our party, they didn’t get into the priority checking-in queue – evidently their flirting techniques weren’t quite up to scratch. I find there are two types of travellers on those early morning flights – those who stay awake and those who fall asleep; so some of us marvelled at the view of the mountains as we soared into Turin Airport and some of us woke up when the wheels hit the tarmac. Ryan air exceeded themselves with one of their many on time flights and fanfares on arrival. It was beautifully sunny as we stepped off the plane and headed for the second coffee hit of the day whilst the more organised amongst us went to get the car we had hired from Sicily By Car. Some say Mussolini died in 1945 but we were sure he was there behind the car hire desk being officious and making us stick to our allotted car pick up time! For those of you in any doubt, lunch, or LUNCH was talked about with relish pretty much every hour. Where were we going? What could we eat? What were we drinking? Was it small, quiet and out of the way? 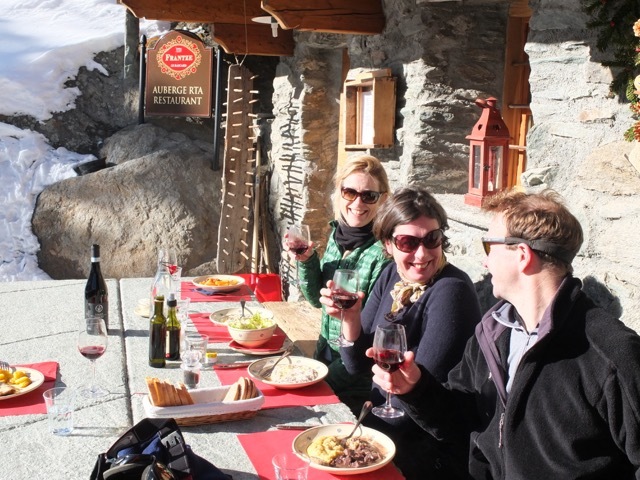 Our ski day was dominated by LUNCH – but that’s because we are food and wine obsessed. The general idea was to ski with only a small stop for coffee until about 2.30 to 3 whereupon we would hole up in some mountain top restaurant for a bit and then ski the last lift down. At the end of the day we enjoyed a few beers and nibbles in a nearby bar before heading back to the hotel for some not very well earned spa time. The Relais has a great spa basement with a huge bubble pool, steam rooms, saunas and even an outdoor Jacuzzi which we managed to abuse on a regular basis. I have to say that the first day it wasn’t really necessary to indulge in the spa but it was so well worth it on the following days when we had been buffeted by every wind known to man, had freezing snow pelted into our faces and given our legs a thorough workout. Running up the outdoor steps in a wet swimsuit before hopping into the outdoor Jacuzzi with the snow falling on your head was an experience that will linger for some time. Oh yes, that and the snow angels we all did directly outside the hotel reception area – and yes, we are all approaching 50 years old… I hope they didn’t notice! 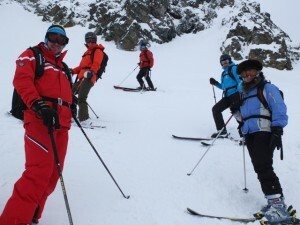 The next day, having had a relatively early night, we met Emrich from the Champoluc ski school for a 9am start. Keen as mustard we started up the mountain with the first topic of conversation being LUNCH (I did warn you). Emrich recommended the restaurant Campo Baso which serves an amazing Tibetan curry on Tuesdays. 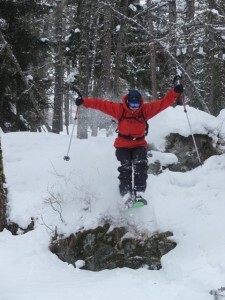 This confirmed, we headed off for a great mornings ski taking in a bit of off piste down to Stafal for coffee then over towards Alagna and Gressoney. Lunch at 2.30 was very much looked forward to as we didn’t really slow down in between. That evening we sat in the hotel restaurant reliving our face plants and eating a large amount of cheese. The local cuisine is very heavily biased towards cheese, cabbage and potatoes. I will let you make up your own mind about that! On Wednesday, we booked Emrich again. Our party of 5 split into two groups with the more intrepid members skinning up the mountain for two and a half hours to do some off piste and the others sticking to on piste and skiing all the way to Alagna. The runs, despite the horrible weather, were fabulous. Empty, wide, well pisted etc. 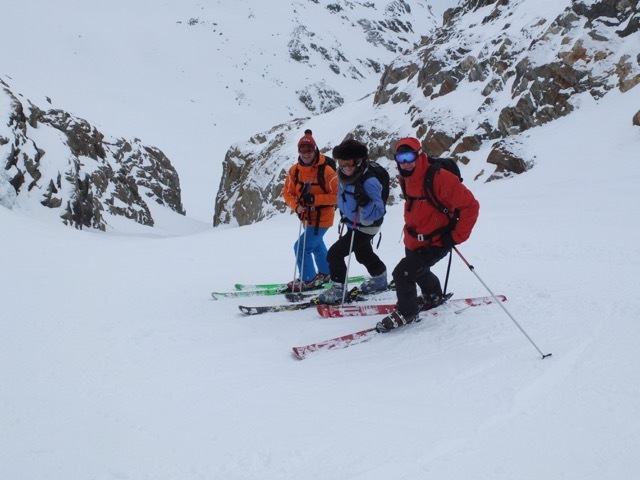 The off piste group had a mixed result with some skis not behaving terribly well and some interesting charades later for us to guess what movements they were doing on the mountain side! We met up again for lunch at the fabulous l’Aroula – it’s a quick little off piste runnette to the restaurant with the cosiest little room in which to thaw out. Our food options were varied but it appears that mountain soup is not for the faint hearted. Their love of cheese, cabbage and potato was embodied in a bowl with the added thrill of a sausage or two. Good thing it was so cold outside that we could burn calories just by breathing. We decided, in a fit of madness to open a bottle of Amarone, the classic, full bodied, heavily fruited Italian red wine delicately served in a glass decanter no less– not bad for a restaurant in the mountains! Well, at 16% alcohol we were all feeling somewhat light headed and more than a little silly as we skied home. Thursday brought heavy snow all day so we kept to the pistes. The wind was so forceful at the top of the mountains that we were scared of getting stranded. Our lifts, both chair and bubble stopped on various occasions, and we were left to swing gently in mid air which is always very reassuring. I am not sure the Italian couple in one lift appreciated our rendition of 80’s hits. Luckily I only understood a little of their conversation. I think the expression on their faces rather said it all. So this was critically the last day of LUNCH. At the very beginning of our stay, Ski2 had given us luncheon vouchers to be used at various eateries both on the mountain and in the town. We had been told that the restaurant Collebettaforca at the top of the Collebetta lift was a hidden gem and took the vouchers. They were right. OMG, we had the most delicious lunch of all successfully using 19 vouchers in one go– feather light fresh cottage cheese and homemade pillow like foccacia. The most awesome foie gras with onion relish. Guinea fowl with slow braised fennel and garlic and of course the eponymous homemade mountain pasta. It was mouth-wateringly good. The service was friendly and charming and we loved it. 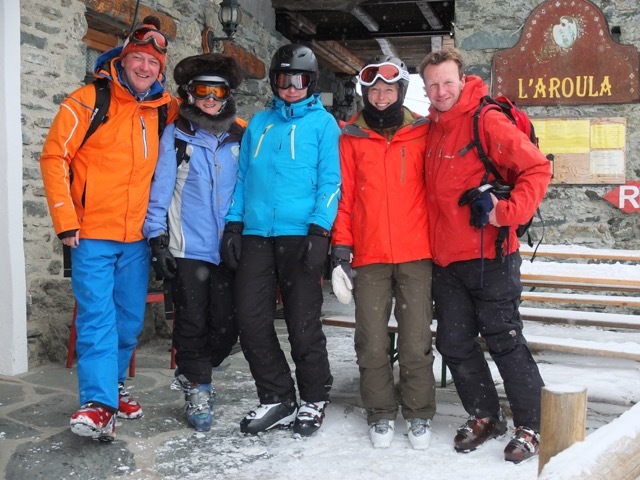 The thought of the ski down to Champoluc in the gale force winds having spent a good hour and a half tucked up in the warmth with great food and wine was rather daunting but we made it down and no one had any broken bones or twisted legs and arms so we all thought we got off lightly. The day was finished off with one of our group – who shall remain nameless – singing karaoke Abba and earning herself a free grappa. That evening the spa was a welcome and warm friend. Our last day dawned with the surprise of over a metre of fallen snow on the hills. With only hours to go before we were due to head home, the lure of “snorkel powder” was too great – in fact it was a FANTASTIC opportunity to experience sun, snow, powder, great conditions etc etc and at least two of our group sprayed themselves top to toe with snow by about 9.10am. By 11 we had dug the car out of the car park hotel and were on our way back to Turin. To summarise, we had a really great few days in Champoluc being royally looked after by Ski 2 and the lovely team at Relais des Glaciers. We thoroughly enjoyed ourselves at every moment. The resort is small and compact but has beautiful, well-maintained runs. The food and wine we found was exceptional and we are all looking forward to returning next year. Thank you Mountain Beds for arranging it all. Thank you to our guest blogger Filippa Scott. This entry was posted in Blog on February 25, 2015 by Mountain Beds.